Gone are the days of having to slow cook your ham all day to infuse those rich flavors you desire. 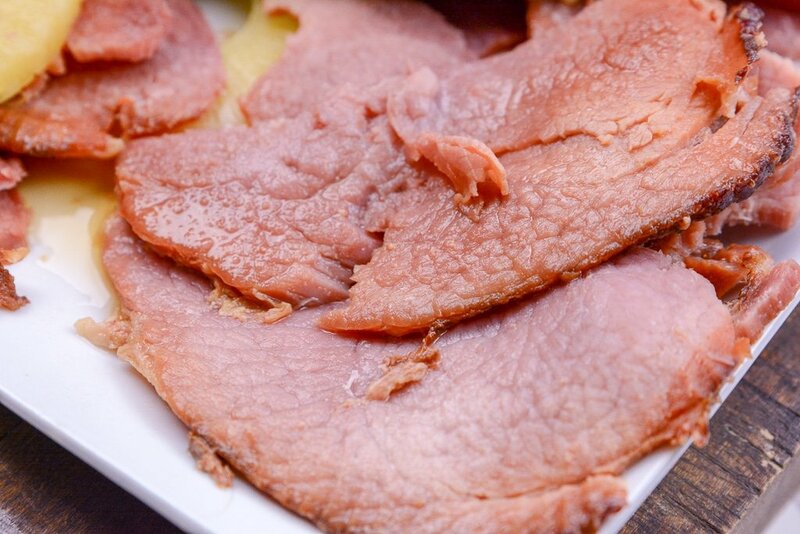 With your handy Instant Pot, you can have this Instant Pot Honey Ham ready in 30 minutes! Yep, just 30 minutes and you can put this on the dinner table ready to serve with all the fixins’ for your family. In most homes, ham is a food you only have around holidays, because of the extensive work and time that goes into them. Now, you can have this ham even on a busy workday, because it takes minimal time and effort to make. Then just use up the leftovers in different recipes to get it used up! 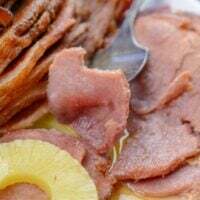 The Best Ever Instant Pot Honey Ham 4 simple ingredients are all that is required for this delicious mouth-watering honey ham. With Easter around the corner, I thought it would be really fun to share a recipe to help you get ready for your Easter feast. You can prep this in minutes and have it cooking away so you can put more focus towards your lavish side dishes and desserts. Then before you know it your ham will be ready, as well as all your sides. You can sit down and enjoy your Easter dinner with your family, and not have to worry about prepping all morning and having a huge cleanup after. Plus it won’t heat your whole house up like if you cooked in the oven. Here are a few of my favorite recipes we like to make up for a big Easter feast for our family. If you are needing some inspiration and ideas, you might enjoy this list! Instant Pot Honey Ham| It is the main course for our meal, goes perfectly with all the other sides. Green Bean Casserole| This contains no cans of soup and is creamy and delicious. You can’t have an Easter dinner without this tasty side. Million Dollar Mac n Cheese| Okay this might not be a traditional side, but for those who love cheesy goodness will love the fun side. Garlic Parmesan Asparagus| Grab that Instant Pot and whip up this asparagus. It has just the perfect hint of garlic, that my heart loves. Garlic Rosemary Instant Pot Mashed Potatoes| This is a great side dish as well, you can never go wrong with a good hearty and silky smooth bowl of mashed potatoes. Strawberry Jello Cake| This is a fun dessert that is a moist cake, and you poke holes and pour a Jello mix, and top with whip cream. It is packed full of delicious flavors. Samoa Cheesecake| Talk about decadent, this is one dessert the whole family will enjoy. For leftovers, I love to eat ham a day or two as is and then incorporate it into other dishes so we don’t get tired of eating the exact same things. I like to dice up the ham and create omelets or even just scrambled eggs for ham for breakfast. For lunch and dinners, I might use some ham for ham and beans, ham and dumplings, toss it in with some au gratin potatoes, or Instant Pot Chicken Cordon Blue. It helps you to utilize the leftovers but not feel like you are stuck eating a ham the same way over and over again. This ham is great for any holiday or a weekday meal. 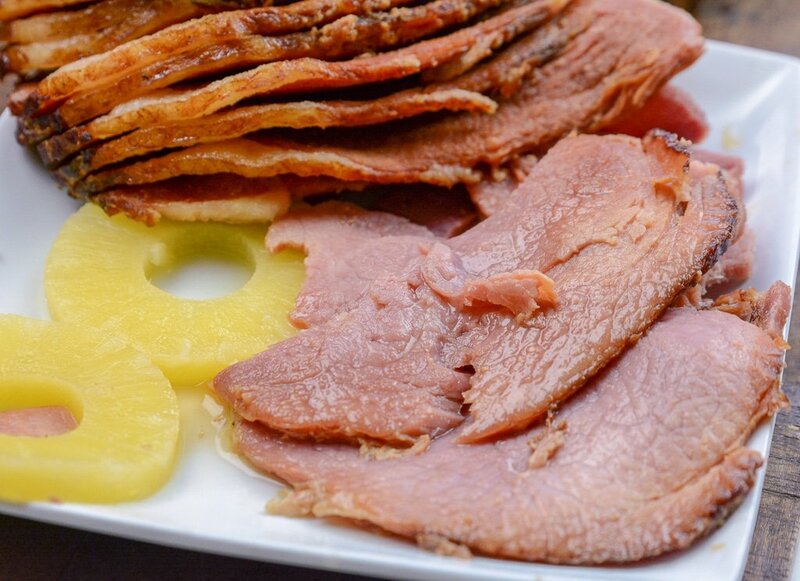 I know if you make this you will really enjoy the sweet and savory taste of this juicy ham. Happy cooking! 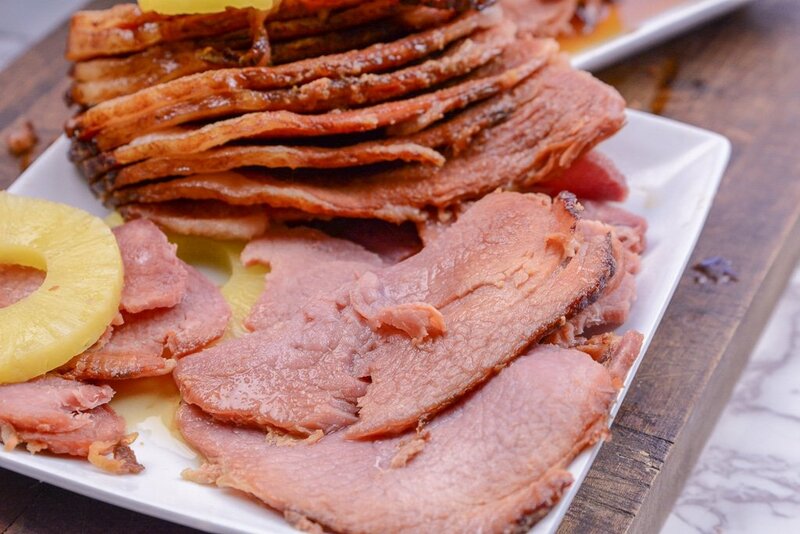 4 simple ingredients are all that is required for this delicious mouth-watering Instant Pot honey ham. 1/2 cup brown sugar in the bottom of the Instant Pot. Cut a little ham off the edges if it won't fit. Add can of pineapple with juice. Place on manual high pressure for 10 minutes. My ham isn’t spiral cut, but should work still, right? And the liquid from the can of pineapple is enough?! Thanks, love your recipes! Was your ham thawed or frozen? Would it be okay to make frozen? 7 lb of ham is a lot for my husband and I. How would this be amended for a 3 or 4 pound ham? It sounds delicious! I made this tonight using a 3 pound ham. Followed the recipe exactly as written, using same measurements and cook time and it turned out perfect! what is /2 cup of brown sugar? Is that supposed to be 1/2 cup or 2 cups? Are you using a fully cooked ham? I’m wondering the same thing. I have a smoked half-ham in the freezer from one of our pigs and would love to give it a try! How long does it take for it to come to pressure? , btw outstanding design and style. Is this a precooked thawed ham? Is the can of pineapple the only liquid? Do I need water to pressurize? This was the best ham I’ve ever eaten! My husband said the same thing! I will be watching for hams on sale so I can make this again soon! Thank you for an awesome Instant Pot ham recipe! I’m not a pineapple fine. Have you tried this without the pineapple and just used water instead? Mine always burns on the bottom from all the sugar. Is there enough liquid in this recipe so you won’t get a “burn” notice? This looks delicious. 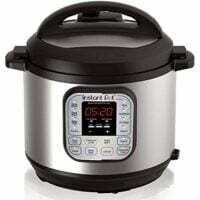 However, I have a question – the written recipe says to set the IP at 15 minutes but the video shows the IP being set at 30 minutes – which is correct?